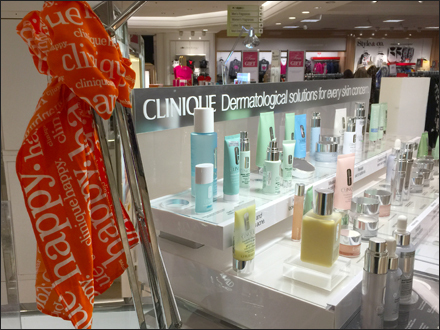 Most Clinique® cosmetic colors and packaging are cool or neutral in this point-of-purchase display, but a bright orange Clinique Branded Bow adds a splash of fluorescent color for emphasis. I have seen better Bows, but good thing that I was not asked to do it because mine would have been far worse. With just a bit more care, straightening and fluffing the Clinique name would have been more prominent. 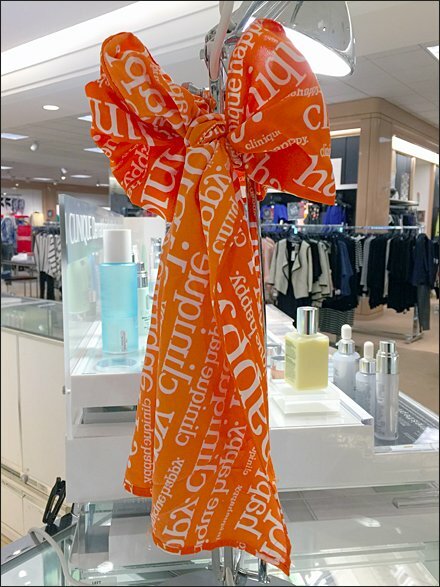 If you like the concept, consider sending your point-of-purchase bows professionally pre-tied. The orange color was a good idea in any event.